Minnesota families inflicted with poverty, substance abuse, mental health, or domestic violence have a better place to call home, thanks to members of IAM District 77 in Vadnais Heights, MN. Union volunteers from throughout the district recently helped restore a St. Paul facility dedicated to helping such families get back on their feet. More than 30 District 77 members, spouses, children and retirees helped FamilyWise with a number of projects including cleaning the building’s exterior, removing old carpeting, breaking down old office furniture, and organizing old financial records. 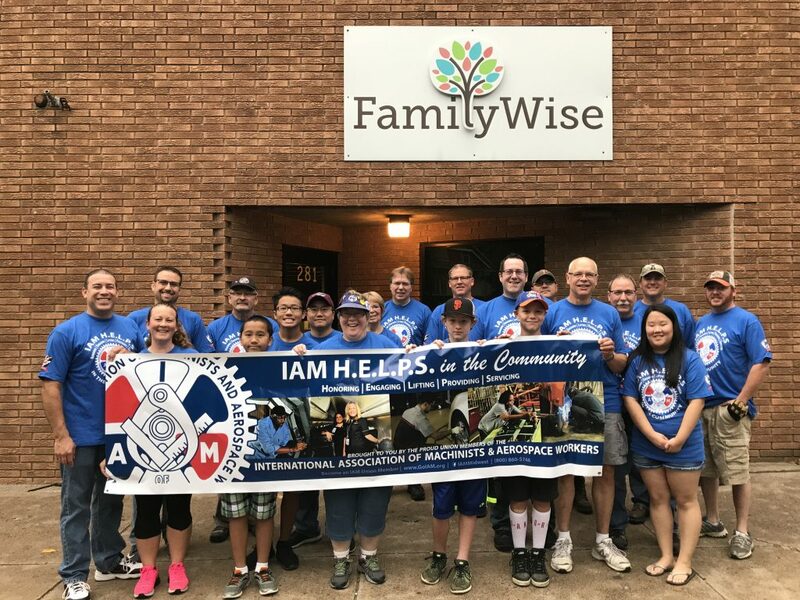 Members of IAM District 77 help restore a St. Paul, MN facility dedicated to helping families get back on their feet as part of IAM H.E.L.P.S., a Midwest Territory initiative aimed at doing more in the communities in which we live. The effort was a part of the IAM Midwest Territory’s “IAM H.E.L.P.S. in the Community” program. IAM H.E.L.P.S. stands for Honoring, Engaging, Lifting, Providing and Servicing. The initiative is a part of the territory’s continued efforts to do more in the communities in which we live. IAM District 77 Secretary-Treasurer Ross Olson coordinated the event for the entire district. Executives at FamilyWise were more than appreciative of the Machinists’ help. In addition to their time and efforts, District 77 also donated a 40-inch television along with nearly a dozen different board games for the families at FamilyWise to enjoy.